Your miniature schnauzer loves the challenges of training and learning tricks. The miniature schnauzer breed has a reputation for being highly trainable. Your mini schnauzer is a small, stocky, terrier type dog who is bright and alert. He loves to please his owners and, with positive training techniques, he follows commands obediently. Train your mini schnauzer puppy to pay attention to you first. Your puppy is easily distracted by all the exciting things he sees and smells going on around him, so before you can teach him commands, you need to make sure he knows when he has to listen to you. Use treats during training but don't let your dog see that you have them with you. To get his attention, say his name then move away from him. When he moves towards you, praise him and give him a small treat. In her book The Miniature Schnauzer, Phyllis De Gioia suggests that it is important to offer the treat between your face and your puppy's so that he must make eye contact with you. Repeat this exercise in sets of five at frequent intervals and in different places until your puppy pays attention to you immediately you call his name. Teach him basic command words. These need to be simple, direct and preferably only use one word. Use the word "sit" rather than "sit down." The command "down" teaches your puppy to lie down, so combining command words confuses him. "Heel", "stand" and "stay" are other useful command words. The "heel" command is particularly important if you want to walk comfortably with your dog, and not constantly trip over his lead as he wanders around you. In particular, a mini schnauzer is likely to develop a bad leash pulling habit if you don't teach him to walk to heel, and his strength makes him difficult to stop. Loads of praise, treats and repetition of commands are the best method of getting him well t rained. 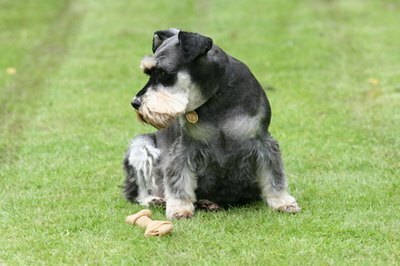 Ensure your miniature schnauzer has learned all the basic commands on the leash when you are outdoors with him. Once you are confident he responds to your commands without question, you can start to train him off the leash. In her Miniature Schnauzer book, Karla S. Rugh recommends that you make him sit then remove the leash and continue with a normal training session. If he doesn't follow a command put the leash back on and repeat training for that command with the leash on. It is really a case of trial and repetition. Once he has mastered training off the leash you can teach him to fetch a ball and other more advanced skills, such as extended stays. Your mini schnauzer has an excellent capacity for learning agility tricks and dog sports. In fact, he loves the challenge of learning new skills. Avoid punishing your miniature schnauzer as a way of correcting any problems with behavior. This breed does not respond well to negative behavior such as shouting, screaming or hitting with a rolled up newspaper. If he does something wrong, shouting "No" at him will only increase his anxiety, and according to Phyllis DeGioia, is more likely to make him repeat the behavior. For example, if he chews the furniture and you shout at him to stop, he feels stressed, and he is likely to chew the furniture more to relieve his anxiety. As DeGioia also points out, if you behave like this all you will do is teach your dog to be afraid of you. Instead use the command word "no" in a firm and confident voice to stop poor behavior. Training requires time and patience. Give yourself a treat after successful training sessions. It will encourage you to persevere with training a happy, healthier dog. Don't attempt to train your puppy off the leash too soon in a public place as he may get hurt. What Can Mini Schnauzers Eat ? Is a Miniature Schnauzer's Hair Curly or Straight? What to Do if Your Mini Schnauzer Is Acting Shy?